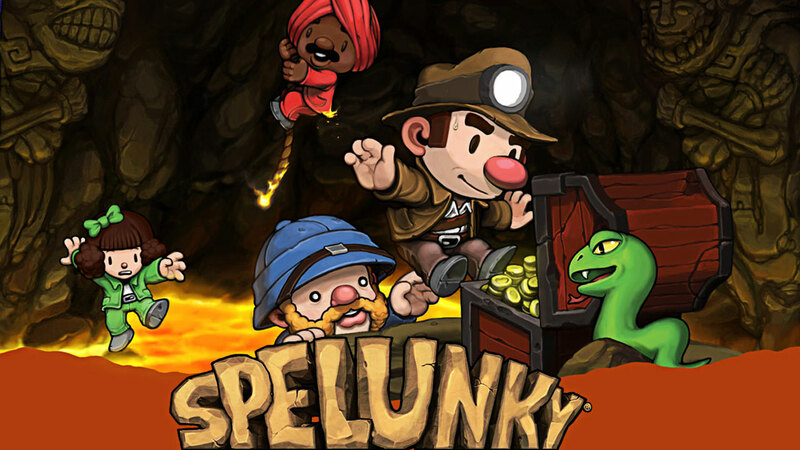 Spelunky is a platform game you can get for PC or console. JD got it for PC but when we got an XBox we decided to buy it to play there. It cost £10. It's an understatement to say we've had our money's worth out of this game as we've all played it LOTS. As the title suggests you're an adventurer spelunking caves to find treasure. You collect money and items as you go. One of the best things about this game is that every level is different, it's randomly created every time you start. You never know what to expect and this stops the game from feeling repetitive. 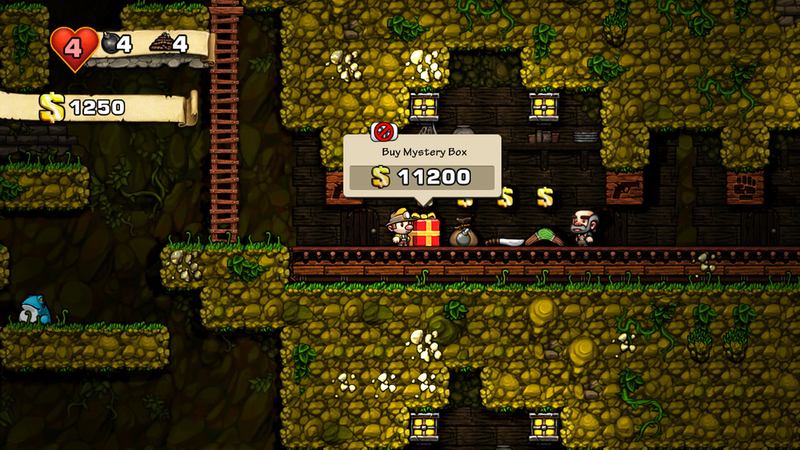 There are boxes with items like extra bombs or ropes here and there, sometimes you get a really good item in these so it's always tempting to get to them to find out. Especially for JD who can't resist a box no matter how hard it is to get to it. There's also a damsel to rescue each level, if you get her safely to the exit door she'll reward you with a kiss which gives you an extra life. No sexist stereotypes here though, in the settings you can set the damsel to be male or even a pug dog if you prefer canine smooches. 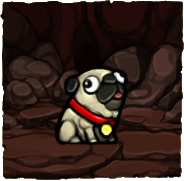 The best thing about the game for me is the dog's stupid face, he looks so hopeless when you find him stuck in the caves. There's also the option to sacrifice the damsel at altars you sometimes find in the caves, it can give you extra items or lives if you please Kali. 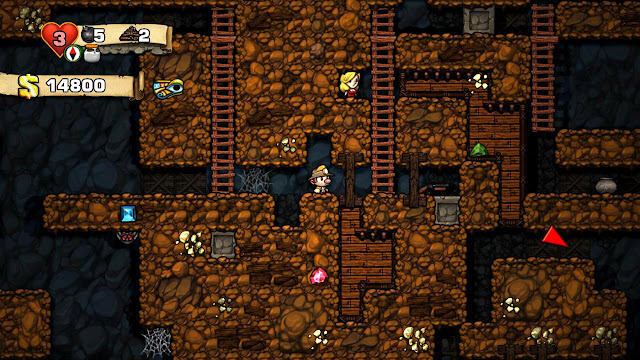 There are further levels to the caves including jungle, ice and pyramids. All with different monsters and traps to avoid. 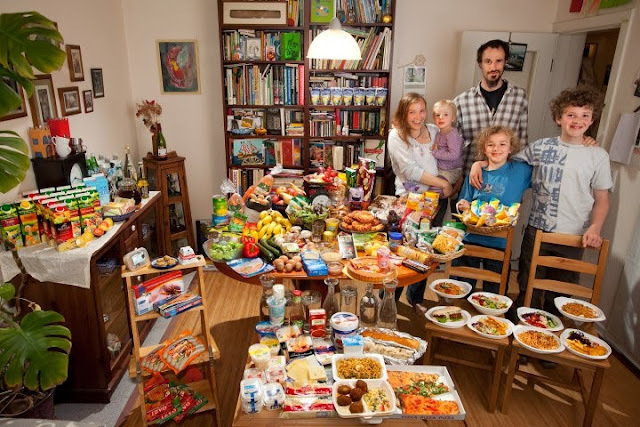 This picture shows a shop where you can buy extra items. The shopkeeper looks like a friendly old guy but if you try to take something without paying he gets out his shotgun and goes insane, rampaging until you're dead (or he is!). So be careful. 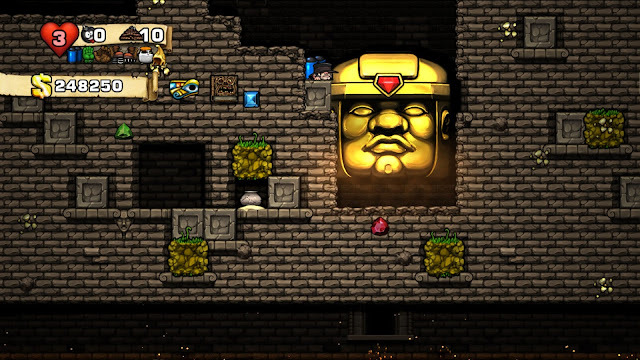 On the final level you have to face Olmec, a huge gold statue intent on smashing you under his bulk. You have to make him smash down into the lava beneath tricking him into killing himself. I recently completed the game after MONTHS of playing. 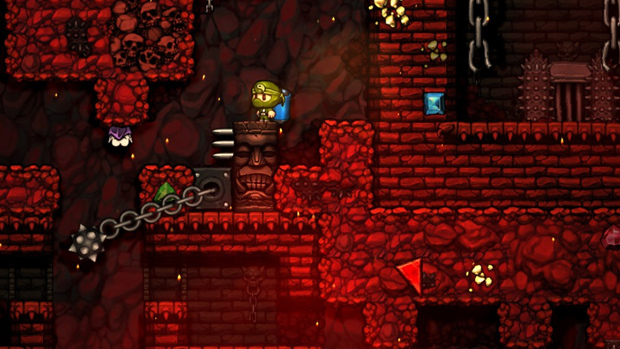 It was so satisfying to finally beat Olmec. This is my character (looks a lot like me, right? Glasses, mid length brown hair, rotund ^_^) victoriously leaving the caves with a giant golden skull. You'd think the game ends there but oh no, there's so much more to do. There's a black market to find, a giant wormhole to explore, a city of gold to discover and hell to contend with. Plus there's lots of achievements to complete. JD just finished a speed run - Speedlunky - where you have to finish the game in 8 minutes. Now he's trying to complete the game without picking up any treasure, which looks fiendishly difficult to do. It's a simple game but there's so much to do that it really keeps your interest.